Look ahead, whether starting or continuing at the University of Nebraska at Kearney. This December, aside from the holiday break, the date you may be focused on is the last day of Fall 2018 classes. But as the semester winds down, there are still some important dates to remember for next year. In the midst of studying for finals or preparing for the break, you can use this information to stay organized for spring. Enrolling in online courses—For those of you currently enrolled at UNK, you may have been so busy with current courses that you have not yet enrolled for the Spring 2019 semester. Since online courses are filling up quickly, please reach out to your advisor soon to have your advising flag lifted and get their advice on courses for the upcoming semester. Applying for graduation—If you hold senior status and are planning to graduate in May 2019, the graduation application is open until February 1, 2019. If you haven’t requested your Senior Check from the Registrar’s Office, now would be a great time to do that to ensure there are no surprises when you apply for graduation. You will complete the graduation application in your MyBlue account. Preparing to start the semester—Classes for the Spring 2019 semester kick off on January 7. To eliminate stress for yourself after the holidays, it’s best to take care of your schedule, financial aid, books, etc. before the holiday break. Contact UNK with any questions you may have about the details of your spring semester. Applying to UNK—If you’re still considering applying to UNK and enrolling in the Spring 2019 semester, there’s still time! Our online coordinators can assist you with the application and enrollment process. One thing to keep in mind is that UNK offices are closed for the holiday break from December 22 to January 1, which means it’s best to get your application in now so you can get through the admissions process prior to the break. Classes begin on January 7, and you will only be able to enroll in courses during the first week without written approval by the instructor or department chair. Good luck to those of you preparing for fall semester finals—and if you’re still considering applying to UNK, let us help you become a Loper! 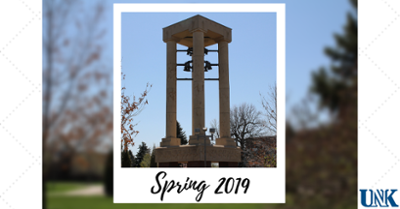 Contact us about spring deadlines, important dates, or any questions you may have: 1-800-865-6388 or ecampus@unk.edu. We’re happy to help you get started in 2019!